The management of bronchospasm in patients suffering from chronic obstructive pulmonary disease. SulprexTM Nebuliser Solution may be administered from a suitable nebuliser or an intermittent positive pressure ventilator. Adults (including elderly patients and children over 12 years): 1 ampoule three or four times daily. Open the packet and remove the blister. Carefully separate an ampoule from the blister. Twist off the top. Always hold the ampoule upright. Squeeze the desired amount of the nebuliser solution into the nebuliser chamber. If dilution is needed follow the doctors instruction. 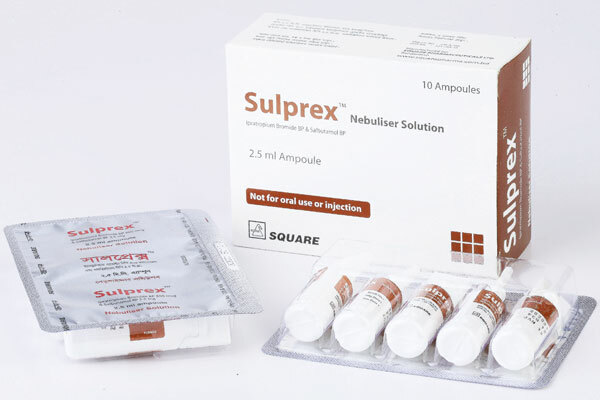 SulprexTM Nebuliser solution: Each box contains 10 ampoules in blister packs.